Participants at a previous “A Day for Women” check out classes offered before the day begins. This year's event is scheduled for April 14 at Sierra College in Grass Valley. Sierra College Foundation and the Soroptimist International of Grass Valley have joined together again this year to sponsor “A Day for Women” from 8:30 a.m. to 3:15 p.m. on April 14 on the Grass Valley campus of Sierra College. 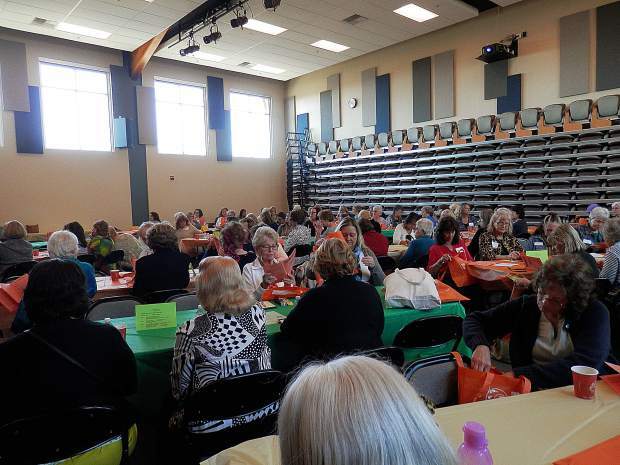 The event is the return of a conference for women with workshops, shopping, networking and lunch presented by the Soroptimist for more than 28 years. The larger venue will enable the event to offer 18 workshops at six per hour. Topics for this year’s classes include home and garden; personal growth; food; body focus and technology. Well-known speakers will present again this year, some of them new, all of whom are experts in their fields. Workshops will be lead by Nevada County business leaders, said Judy East, chairman of the Sierra College Foundation Coordinating Committee, NCC and co-president of Soroptimist Club who chairs this year’s conference. “We are so please to bring area women a variety of topics from domestic skills to interpersonal and technology skills,” added East. “Everyone will go away with an enhanced understanding of the topics from the workshops they attended. Networking with new and active women in the community is one of the goals of the event.” Lunch will provide an opportunity for those in attendance to both befriend new people and to shop with vendors. The $45 ticket admits one woman for any of the 18 classes, a box lunch, shopping, networking and “fun.” All profits from the event go to support Soroptimist International of Grass Valley service projects for women and children and the Sierra College Foundation’s programs for students. The event is sponsored by Wells Fargo Bank, Yubanet.com, Dignity Health Sierra Nevada Memorial Hospital, Gateway Real Estate, KNCO Radio, Betty Stiving at Verger Mortgage, Ben Franklin Crafts, Beautiful, The Pilates Place, Jenni Johnston of Edward Jones, Len Stevens Construction and many other local businesses. Registration is available at http://www.sierracollege.edu/dayforwomen.